We’re planning to begin our kitchen renovation at the end of the summer, and of course I’m having a hard time thinking of anything else! This is going to be the “Forever Kitchen” in our “Forever House.” It will be here as long as I live here. There will be no redos or further updates allowed (both for budget reasons and for my poor Handsome Husband’s sanity), so I’m really trying to stay away from any and all things trendy and looking only toward the classics. However, I will, of course, be putting my own twist on tradition! We’re still meeting with structural engineers and the like, but I do have an idea of how it will connect with the rest of the 1790 house through style, colors, and patterns. I also have a general idea of layout and am now getting quote ranges for cabinetry. I’ll have more details as I figure them out (actually, I’ve already figured a lot of this out, but I’m not going to tell you yet 😉 ). 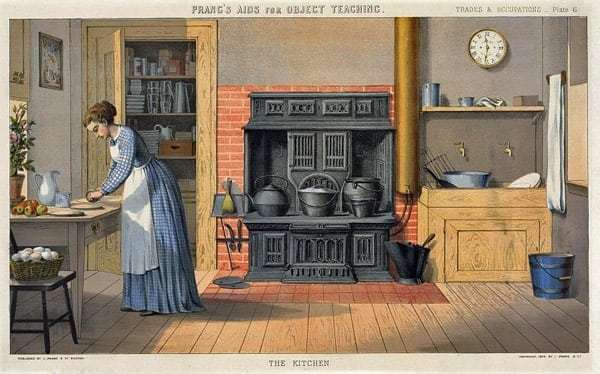 But today, I’m starting a series of traditionally classic kitchen elements I’m coveting — ones that still look fresh in today’s kitchens, and will probably make it into mine! First up, stove alcoves! As you can see in this post about keeping rooms, the current layout of the kitchen really doesn’t work for us. We’re forever walking around the island, and we (especially the HH) want a small wood-burning stove and some cozy seating overlooking the pond. To do that, we have to move the stove to what is currently a blank wall. To give the stove wall some architectural detail and make it feel a little more a part of the living space, I’m pretty sure I’m going to put the kitchen range in a recessed alcove of sorts. 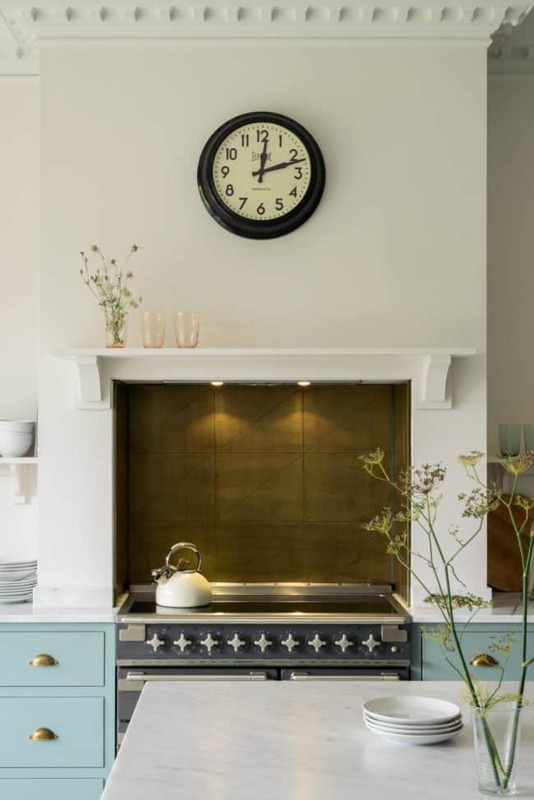 Nobody does modern stove alcoves better than DeVol Kitchens. What is a stove alcove? The stove alcove may have begun in the nineteenth century when people started inserting cast iron stoves into the behemoth hearths of the prior century. 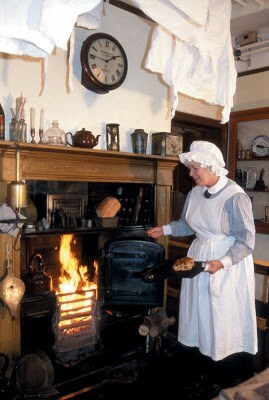 During the Victorian era, inserting the stove into an alcove helped both to contain the stove’s heat and fireproof the kitchen. A modern reenactment via Cottage in the Making. An implication of an alcove by using some curved trim. The deeper the depth, the more imposing and grand the alcove is. Alcoves are a beautiful way to give a contrasting backsplash tile an architectural reason. Full-depth alcoves allow you to have shelves tucked inside for oils and spices and whatnot, like above and below. Layers of “implied history” in a new kitchen by Thomas Jayne and Historical Concepts. Via Instagram. An alcove totally in tile by Gil Schafer via Instagram. The gorgeous kitchen of Instagram darling Maura Endres. Neptune Home via Instagram. This would be a really good look in my 1790 house. Beautifully British, down to the AGA cooker. Foodie Anna Barnett’s kitchen via ATT PYNTA. Shaker simplicity by Block Bros. Custom Cabinets in Maine. Simple yet refined details from Humphrey Munson. This is the route I may have to go. We’ll see. As we are removing our kitchen island, I’ll be “counting” every inch of counter. HA! The above, by DeVol, is far and away my favorite example of this kind of alcove. Also by DeVol, but a more humble kitchen and therefore more humble details in the implied alcove. A small pic from an unknown source, but excepting the word art, I think this implied alcove is very well done. Nice to see as an example with a sloped ceiling. Designer unknown, though Ashley Morrison is obviously the photographer. I’m not sure about this design, but I find it intriguing. I think I would have preferred the hood to go to the ceiling. An artful kitchen nevertheless. Any thoughts about stove alcoves? Outdated or new traditional, in your opinion? The British kitchen designers and their American Shaker/minimalist-style besties are definitely bringing the look into the 21st century, but I don’t think that has to be the only way to do an alcove that still feels fresh, as evidenced above. We are FINALLY ABOUT TO GET SOME SERIOUS SNOW!!! It’s been such a lame winter, freezing without precipitation … except when it’s freezing rain and 26 degrees. Thank goodness Monday is MLK day and the kids won’t miss a day of school. June can get very long in New Hampshire when the winter has been snowy, if you catch my “drift,” e.g. “snow drift.” I’m in such a corny mood tonight! Please forgive. Cream & White Kitchens: Happy Accident of Stroke of Genius? Great visuals–all of the kitchens you featured are beautiful. Let me give you my experience with an alcove for the cooktop. I had my cooktop in a reclaimed brick alcove and I found it very limiting. Unless you have a lot of prep space on either side, which I didn’t, it can feel very cramped. The space in mine was 15″ on one side and 18″ on the other. Although the island was very close, I found it impractical and annoying to have to move everything to the island to prep and adjust cooking. Perhaps if you have at least 24″ room on either side, and the long side of the island facing the cooktop/range, then it would work.